Citroen introduced its premium division DS in 2014. In no time the badge marked its presence with luxurious models like the DS 5LS and DS 6WR. 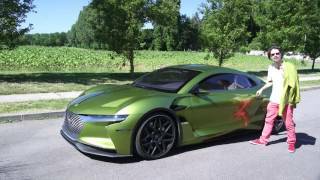 Taking the legacy ahead, they recently shared the DS E-Tense Concept 2016. The model comes with a sporty design that’s made to race while the luxurious interior has everything to steal the limelight. 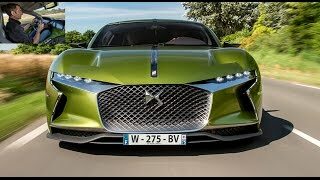 Let us have a look at the review of DS E-Tense Concept 2016 to know in detail about it. The interior of DS E-Tense Concept 2016 is wide and comes drenched in some of the finest materials you know. The flat bottom sports steering wheel hides behind it a 12-inch screen featuring the all-digital instrument cluster while the seats come wrapped in green accents and feature ‘watchstrap style’ finishing. The same accent can also be noticed over the dashboard while the ten-inch touchscreen mounted over the center stack adds perfectly to the gleam. Other features include a camera mounted rear section, digital rear view mirror and clean cabin filtration system. There is also a BRM Chronographes one-off watch that can either be worn or can be attached to the center console. 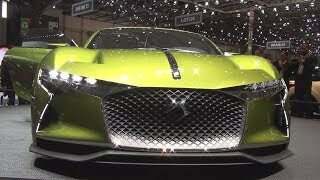 Thus rounding up the interior details of DS E-Tense Concept 2016 I’ll call it luxurious, comfortable and with lots of tech features that indeed set it apart. 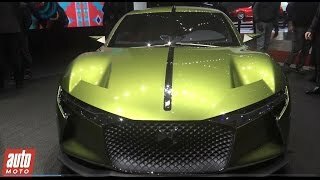 The exterior of DS E-Tense Concept 2016 carries the glimpses of the Divine Concept we saw in 2105. You can notice this with the flowing lines that add bit of aggression to the model’s exterior. Let us start with the front fascia where we have a massive black grille with a DS badge in its center. On the either sides of it sits set of slender LED headlamps with vision technology and integrated daytime running lights. Moving towards the rear end, model features set of elongated slim taillights and a race-inspired diffuser. The vented hood at the rear with the indicator lights further commendably adds to the aggression, making the model look sportier. Thus rounding up the exterior details of DS E-Tense Concept 2016 I’ll call it luxurious, tech loaded and sportier. The all electric drivetrain of DS E-Tense Concept 2016 produces total output of 402 hp and peak torque of 516 nm. 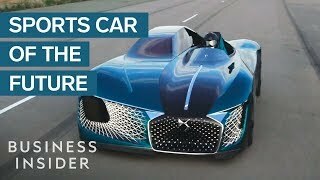 Loaded with lithium-ion batteries the car can travel upto 224 miles on single charge while the 0-62 mph sprint can be knocked in 4.5 seconds. The top speed of DS E-Tense Concept 2016 touches the mark of 155 mph and thus complements the entire race-inspired exterior.